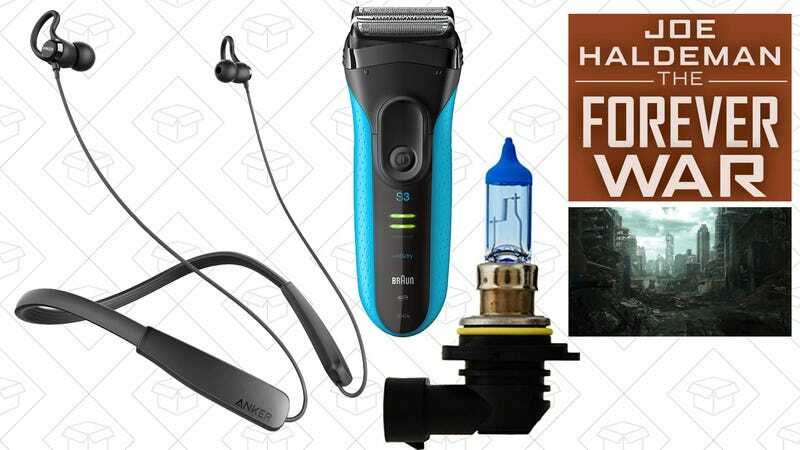 Anker’s newest Bluetooth headphones, xenon-replicating headlight bulbs, and The Forever War lead off Monday’s best deals. Anker’s SoundBuds have long been our readers’ favorite affordable Bluetooth headphones, and if you prefer neckbuds, the brand new SoundBuds Lite are just for you. 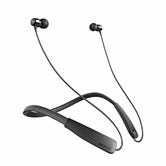 The SoundBuds lite will normally retail for $33, but they’re marked down to $26 as part of a launch promotion on Amazon, and our readers can get them for just $23 with promo code KINJASBL. That code has a limited quantity though, so act fast. Logitech’s Circle home security camera can alert you to movement, let you check in on your cats from work, and act as an intercom, just like basically every other internet-connected security camera these days. But it’s unique in its ability to cut the most interesting things it sees each day into a 60 second highlight reel, all automatically. It was a pretty solid piece of kit at its original $200, but at an all-time low $130, there’s never been a better chance to join the smart camera club. Aukey’s tiny USB car charger is a reader favorite, but this RAVPower model is the same size and puts out the same 4.8A of power over two ports, and it’s only $7 today. You know the little charging brick that came with your phone? 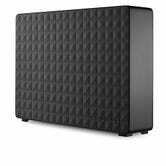 Throw it out, and spend $6 on this replacement from Aukey (with code AUKEYWC1). 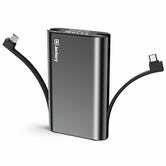 It’s only slightly larger than Apple’s standard iPhone charger, but it includes two ports, folding prongs, and 2.4A of current (shared between the ports) to charge your devices faster. If you don’t see the use for 4K and HDR, the standard Chromecast is also $5 off. USB battery packs are basically just expensive paperweights if you don’t have a charging cable handy, but the Jackery Bolt solves that problem by building them right in. Previous deals on the Bolt have catered to Apple users, with its built-in Lightning and microUSB cables. This new version though swaps out Lightning for USB-C, so basically every Android device should be supported. Plus, its extra USB port means you can plug in whatever cable you want, including a Lightning cable. These deals are available from both SONOS directly and Amazon, though if you buy from SONOS, you’ll get free shipping and a 45-day return policy. 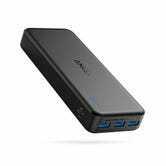 Anker’s PowerCore line has reigned as our readers’ favorite USB battery pack for nearly a year, and its long awaited sequel is down to $36 today, within $2 of the best price we’ve seen. In addition to a fresh new design, the PowerCore II includes three high speed USB charging ports with a whopping 30W shared between them, plus dual 10W microUSB inputs, allowing you to recharge the entire brick twice as quickly. You don’t need to buy a new car to get that fancy, blue-tinted Xenon headlight look. 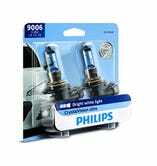 You can add it to your old beater with these Philips CrystalVision bulbs, now $6 off in the size of your choice. If you aren’t familiar, these are standard halogen bulbs that should work in most cars, but the glass is tinted to put out that bluish, 4000K light that’s the hallmark of Xenon. And yes, they’re just as bright as normal bulbs, and they’re completely street legal. 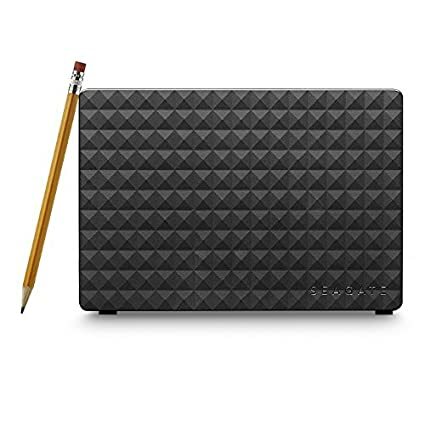 So if you’re ready to make the switch, find the right size for your car (Amazon has a tool to help once you click through to the product page), and you’ll see the $6 discount at checkout automatically. 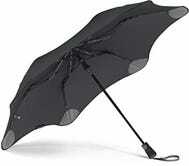 You could buy a $5 umbrella every time you get caught in a storm, only to watch it disintegrate before you get to safety, or you could invest in a Blunt umbrella for 20% off. 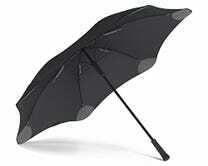 Blunt umbrellas feature rounded safety tips to avoid poking anyone in the eye, include a special pocket for a Tile device tracker, and most importantly, can withstand winds of up to 72 mph (standard model), or 55 mph (for the smaller Metro model). For reference, tropical storms become hurricanes at 74 mph, so if your Blunt ever succumbs to the wind, you probably have bigger things to worry about. You can see it in action in the video above, which personally left me slack-jawed. These umbrellas hardly ever go on sale, but this week only, you can save 20% on either size, and in any color, with promo code 8C8ZALCX. 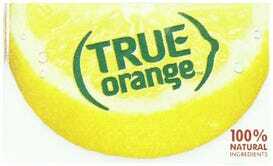 True Lemon, True Lime, and True Orange 20% off. Clip the coupon, discount shown at checkout. 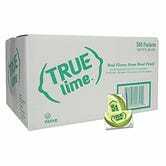 True Lemon, True Lime, and True Orange are basically powdered fruit slices that you stir into drinks if you don’t have any actual fruit handy, and you can stock up with 20% coupons today on 100 and 500-count boxes. I’m curious to try the lime version with a Moscow Mule, and I need someone to talk me out of it. It’s time to be the ultimate son or daughter for Father’s Day. Amazon is running a one-day sale on sports memorabilia, and it’s got something for practically any kind of fan. Baseball, basketball, football, hockey, UFC, and more pieces are signed by some incredibly impressive names. And with Prime shipping on almost all of it, it’s the perfect last-minute gift. For a limited time, Amazon will sell you three pouches of Tide HE-compatible laundry detergent (totaling 144 ounces or 93 loads) for just $14. 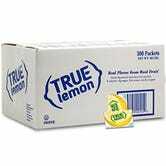 These pouches are designed basically as refills for plastic Tide bottles, but as long as that doesn’t bother you, this is a fantastic price-per-ounce for any detergent, let alone name brand. Just be sure to clip the $3 coupon on the page and use Amazon Subscribe & Save. Once, when I was young and naive, I paid a dealership like $75 to clean my foggy headlights. 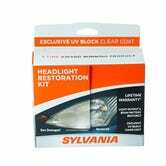 Little did I know, this Sylvania headlight restoration kit does the same job for tiny fraction of the price. Just note that the 20% discount won’t show up until checkout. Before you head out on your next adventure, be sure to pick up this $100 Airbnb gift card for just $90. If you use the service with any regularity, that’s basically free money. And even if you’re a hotel dweller yourself, this would obviously be a great gift for the more adventurous members of your family. If your home or apartment doesn’t have screen doors installed, this easy-to-install magnetic curtain will achieve the same effect, meaning you can let in some fresh air, while keeping out the bugs. You probably rolled your eyes when Pepsi started making “craft” sodas, but it turns out, they’re actually really good, and Amazon will sell you a 12-can pack for $11 when you use Subscribe & Save and clip the 20% coupon on the page. This coupon also applies to Ginger, Black Current and Citrus Cola flavors. Note: You won’t see the 20% discount until checkout. Miniature LED flashlights are so cheap and ubiquitous now, there’s no excuse not to have one tucked away in every glove box and every room of your house. Get two zoomable lights from OxyLED for just $8 today. 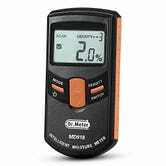 Just note that you’ll need an 18650 battery, or three AAAs to run them. 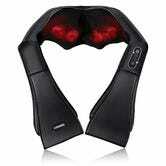 This neck massager may look like a torture device, but trust me when I say it’s the opposite. The weird arm things help you regular the pressure of the massager and it also heats up. Hell, it even comes with a car charger to use it during your commute. It’s like the best straight jacket you’ve ever worn. Take better care of your face with this pair of discounts from Oral-B and Braun on Amazon. 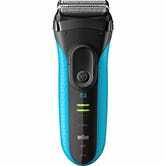 Keep an affordable and useful shaver in your medicine cabinet with the ProSkin Wet & Dry Electric Shaver. At just $35, this little tool should hang out in your bathroom, just in case your other one dies or you forgot to charge it. The Triple Pressure Sensor helps protect your gums from over-brushing. The SmartRing illuminates and pulsations slow, then stop when you brush too hard. Elevate your custom cleaning experience with the multifunctional 360º SmartRing. Visible from every angle while brushing, the SmartRing allows you to see feedback from the pressure sensor, brushing timer and Bluetooth connection with ease. 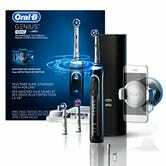 The Oral-B Genius 8000 toothbrush features a Lithium Ion battery and smart travel case that’s designed to charge both your toothbrush and smartphone using only one outlet. Not sure I ever needed that, but okay. The NEW Genius 8000 pairs with your smartphone to enable Position Detection which uses facial recognition to help you know where you’ve brushed. This feature helps to ensure you never miss a zone. Using the Genius 8000’s innovative technology and your device’s camera, our brush helps you maintain healthy brushing habits. Okay, I’m no luddite, but this is insane. 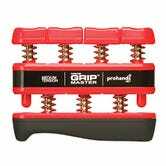 Become the 80's sitcom bully you’ve always wanted to be with the Gripmaster Hand Exerciser for under $10. Choose the strength you want, clip the 20% off coupon, and get to squeezin’. 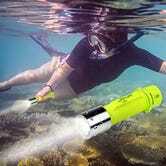 The summer is so close, you can feel it, so make the most of it. 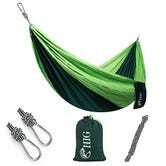 $15 today gets you an ultralight camping hammock (in five different colors), plus two carabiners and tree straps. All you need is a park. Hugo and Nebula award-winner The Forever War remains timeless, and you can get a Kindle copy for just $2 today. If you’ve never read it, I really can’t recommend it highly enough. 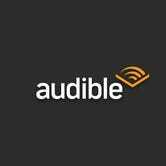 Amazon always offers a free one-month trial of its Audible audiobook service, but for a limited time, they’re also tossing in an extra free book credit to sweeten the pot. That’s in addition to the book you normally get with the trial, and each credit is valid for any title in the Audible library. The best part? The books you choose are yours to keep, even if you cancel the trial before it renews. Just note that this deal is only valid for new Audible members only. Amazon’s celebrating E3 with an extra 20% off a ton of gaming mice, keyboards, and networking gear from the likes of Razer, Logitech, G.Skill, and more. Just check out all the eligible products here, add whatever you want to your cart, and use code 20OFFE3 at checkout to get the deal. $5 off the usual $69 isn’t a huge discount on the Switch Pro Controller, but Nintendo stuff being in stock is noteworthy these days, let alone discounted. If you never played the first three Uncharted games on PS3 (or even if you did), the remastered collection featuring the entire trilogy is down to $15 on PS4 today. That’s not quite an uncharted price (it’s been as low as $12), but it’s still a great value. It’s been awhile since we’ve seen a decent PlayStation Plus deal, so if your membership is due to expire soon (or not), grab another year for $48 today, which is about as low as it’s gotten since Sony jacked up the price by $10.